Building is underway at Genesee Valley Center in Flint Township. 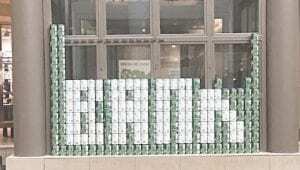 Not the construction of a new store, but instead it’s the Inaugural Flint Area Canstruction Event, a design and build competition to benefit the Food Bank of Eastern Michigan. Teams of Genesee County architects, engineers, educators, businesses and students are working to build statues out of canned goods. The food collected will go to the Food Bank. Details: Visit canstruction.com.